Millard Sheets (1907-1989) Guaymas Rocks 1949 w.c. 16 x 30″ various exhibition stickers verso including Whitney and PAFA along with Dalzell Hatfield label, signed lower left, framed p.o.r. Millard Sheets, N.A. 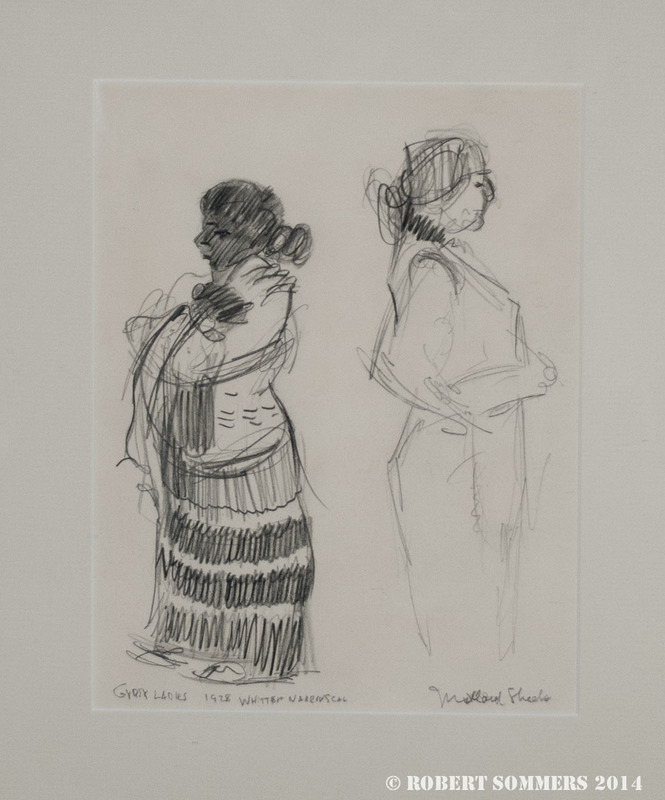 (1907-1989) Born: Pomona, CA; Studied: Chouinard Art Institute (Los Angeles); Member: National Academy of Design, New York Water Color Club, American Watercolor Society, California Water Color Society. Millard Sheets was a native California artist and grew up in the Pomona Valley near Los Angeles. He attended the Chouinard Art Institute and studied with F. Tolles Chamberlin and Clarence Hinkle. while still a teenager, his watercolors were accepted for exhibition in the annual California Water Color Society shows and by nineteen years of age, he was elected into membership. 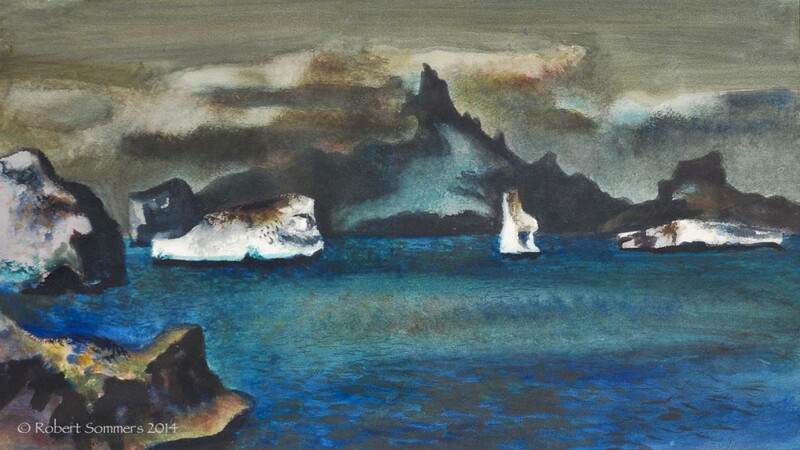 At twenty, even before he graduated from Chouinard, they hired him to teach watercolor painting while completing other aspects of his art education. By the early 1930s, he was well on his way to national recognition as a prominent American artist. He was exhibiting works in Paris, New York, Pittsburgh, Chicago, Houston, St. Louis, San Antonio, San Francisco, Washington D.C., Baltimore and many other cities throughout the United States. At home in Los Angeles, he was recognized as the leading figure and driving force behind the California Style watercolor movement. During World War II, he was an artist-correspondent for Life magazine and the United States Air Force in India and Burma. Many of his works from this period document the scenes of famine, war and death that he witnessed. This experience also effected his post war art for a number of years. Many of his works from the 1940s, painted in California and Mexico, reflect these mood shifts, especially when he used dark tonal values and depressing subject matter. After the 1950s, his style changed again, this time featuring brighter colors and often times depicting subjects from his travels around the world. While Sheets was a talented painter in both watercolors and oils, this was only part of his overall art career. Though his teaching at Chouinard Art Institute, Otis Art Institute, Scripps College and other institutions, hundreds of artists were taught how to paint, and then guided into an art career. He was director of the art exhibition at the Los Angeles County Fair for many years and brought world class art to Southern California. During the Depression, he worked with Edward Bruce to hire artists for the W.P.A. Art Project. In 1946, he served as a president of the California Water Color Society. In later years he worked as an architect, illustrator, muralist, printmaker and juried art exhibitions. Interview with Millard Sheets, 1983.